By Steven J. Oshins, J.D., AEP (Distinguished) Each year, attorney Steve Oshins authors a Decanting State Rankings Chart. 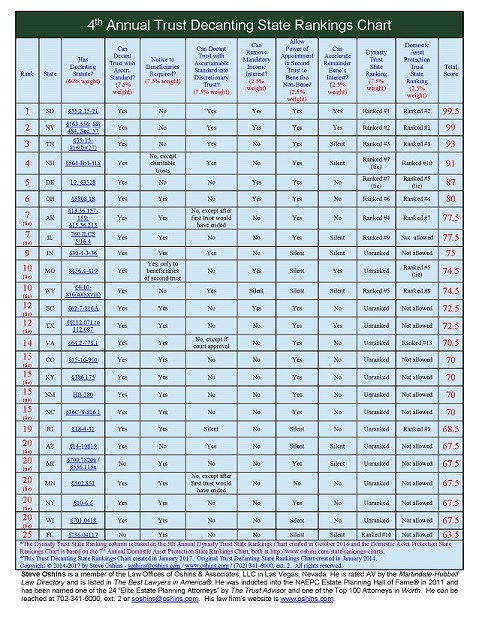 Like last year, Steve has added links to all states’ decanting statutes and made this 4th Annual Trust Decanting State Rankings Chart interactive and there are now currently 25 states. The states are ranked based on the ease of use and amount of flexibility provided by their statutes. Many lower-ranked state statutes have flexibilities that higher-ranked state statutes lack and therefore are often better in certain situations. So the reader should not necessarily conclude that a higher-ranked state is always better. For more information about this subject, please see his newsletter article entitled, “Top 10 Reasons to Decant an Irrevocable Trust” and listen to his 60-minute presentation entitled, “Everything You Need to Know About Decanting an Irrevocable Trust – 2-Part Series”, co-presented with CPA, Robert S. Keebler.